The changeover has been made, and we are now at the new Minerva’s Garden. You will find all of the great content that was here at the old blog, and new content with a fresh and bright new look! Please don’t come to this URL address anymore, but instead subscribe to us at our new blog to get all of the latest posts and information from Minerva’s Garden! So excited to have you see it–please join us at the new and improved Minerva’s Garden. We are located at http://minervasgarden.com. It’s the shortest day of the year, but I am happy in the knowledge that every day from here on out will bring more and more sunshine! I hope you enjoy the winter solstice and celebrate it in a festive fashion! 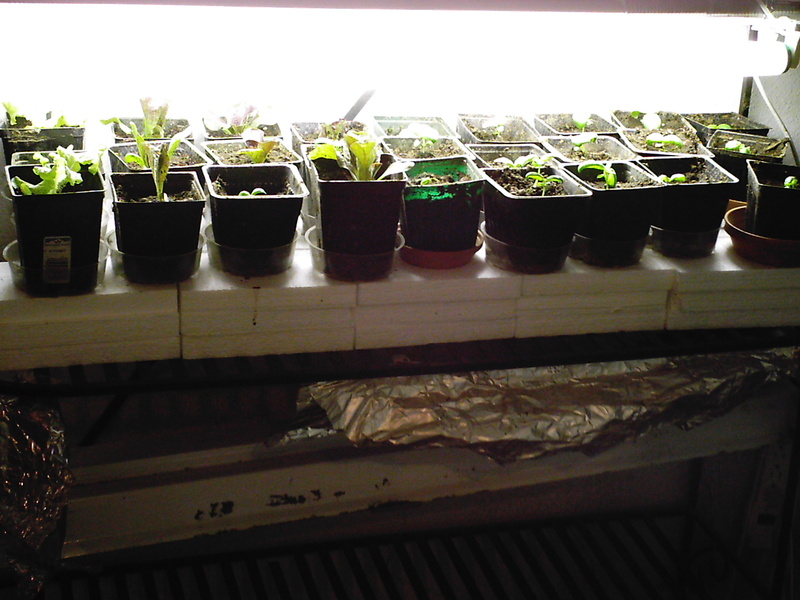 I have baby-sized basil, lettuce and radicchio growing under lights in the basement. This gardening stuff is like an addiction, is it not? Ever the gardening optimist am I. I’ve already re-potted it up into four inch pots, and from there they’ll go into one-gallon-size pots. We’ll see what comes of it–hopefully some useable comestables in the bleak winter months. 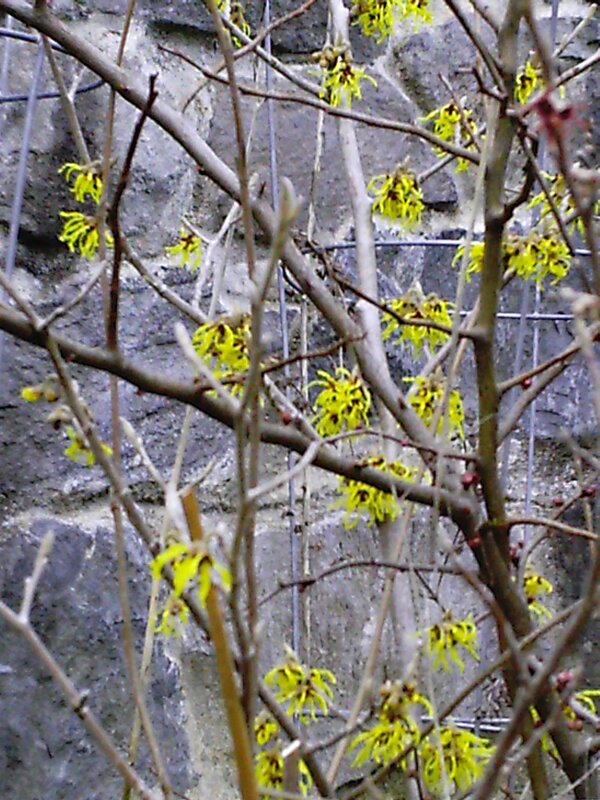 I’ve already got my eye on early spring as well . . . 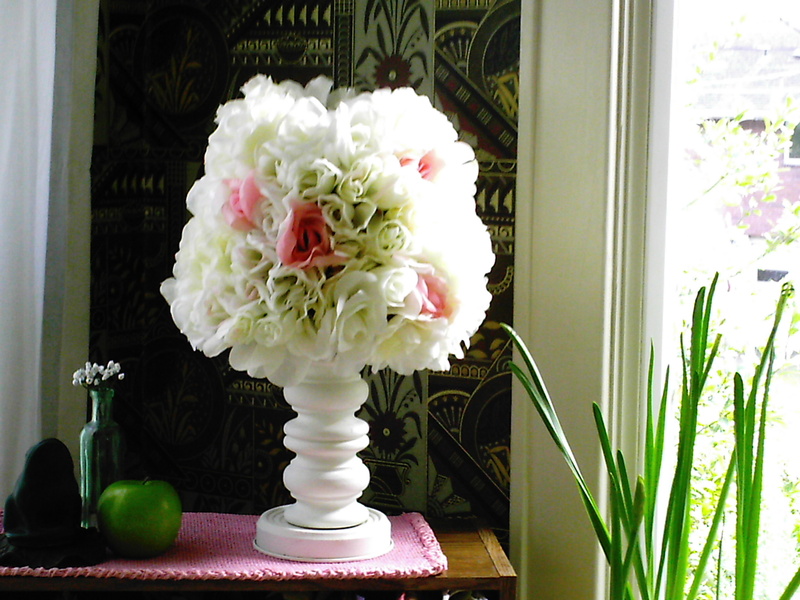 Pink and green will figure prominently after the Winter holidays around the house. 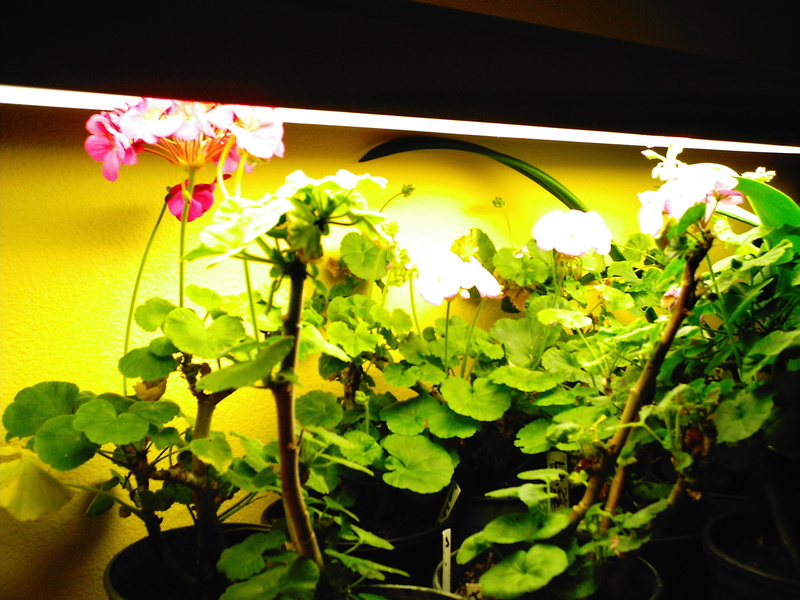 They will spend the winter and spring indoors under lights and in good natural light throughout the house, and then come May they will go back to their rightful spot in my hanging baskets and containers out in the garden. These are the Energizer Bunny of flowers–they bloom all year long if you water and fertilize them. If you like, leave a comment. 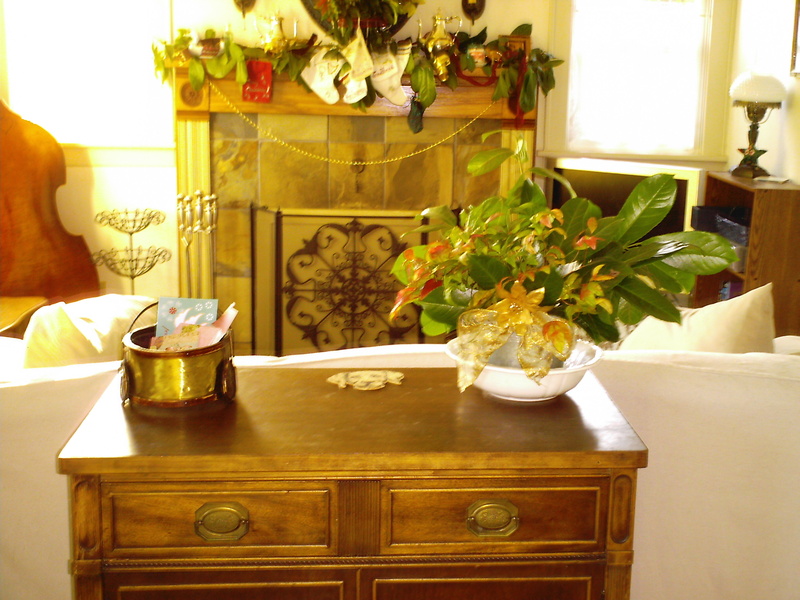 I like to use greens from the garden to decorate for the winter holidays. 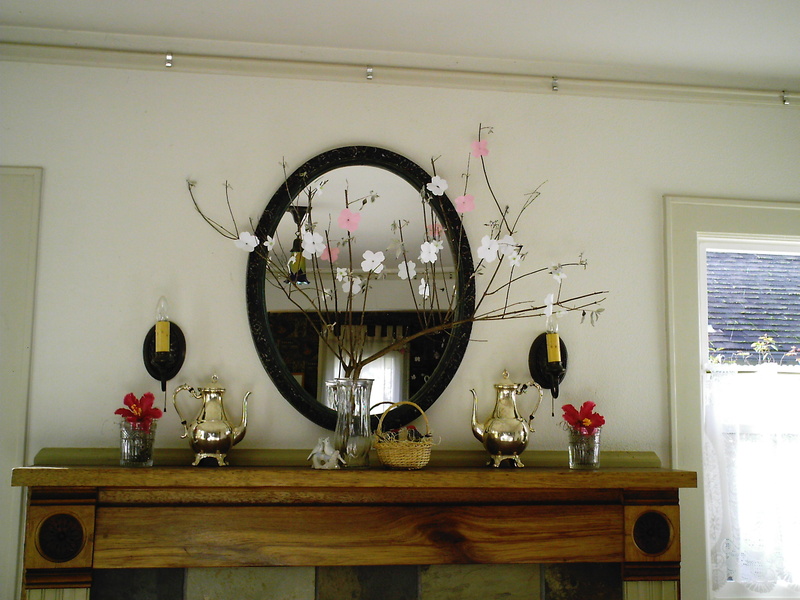 I have a large bay tree, and so I pruned some branches that were sticking out, and used the prunings as part of the greenery for the house and around the front door in containers. 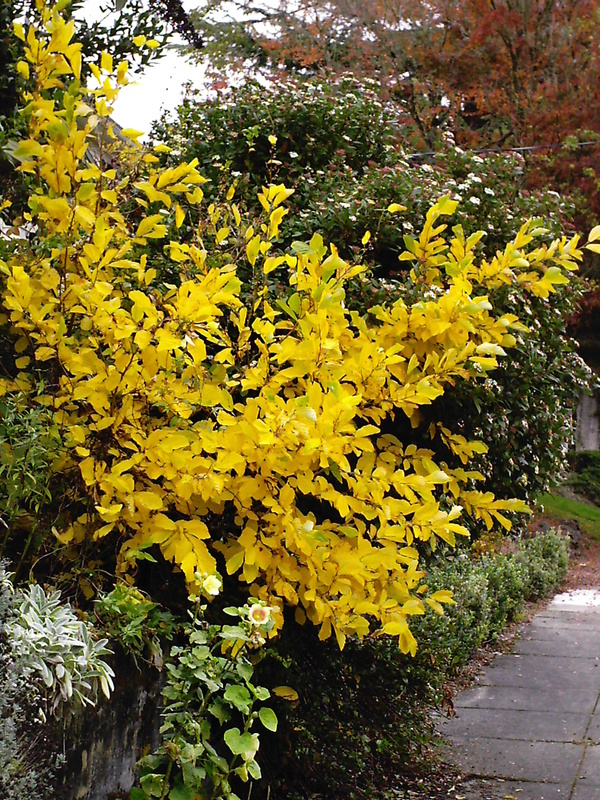 Our neighbors also have tons of English laurel shrubs on their property, and they allowed me to prune some of that to use in decorating as well. I came up with a mix of greens with more Christmas-y items, just things that I like that we’ve collected over the years. Enjoy! 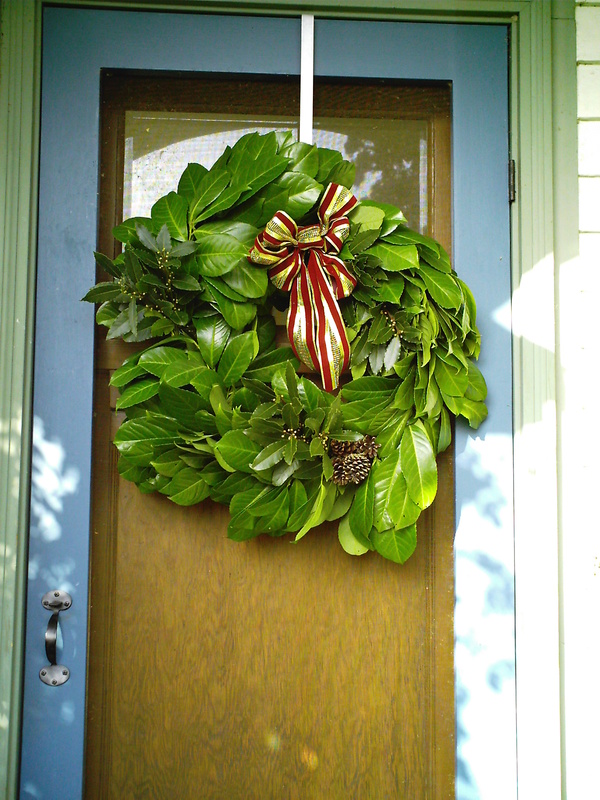 A wreath for the front door made of English laurel, a little bay leaf, and a few pine cones. 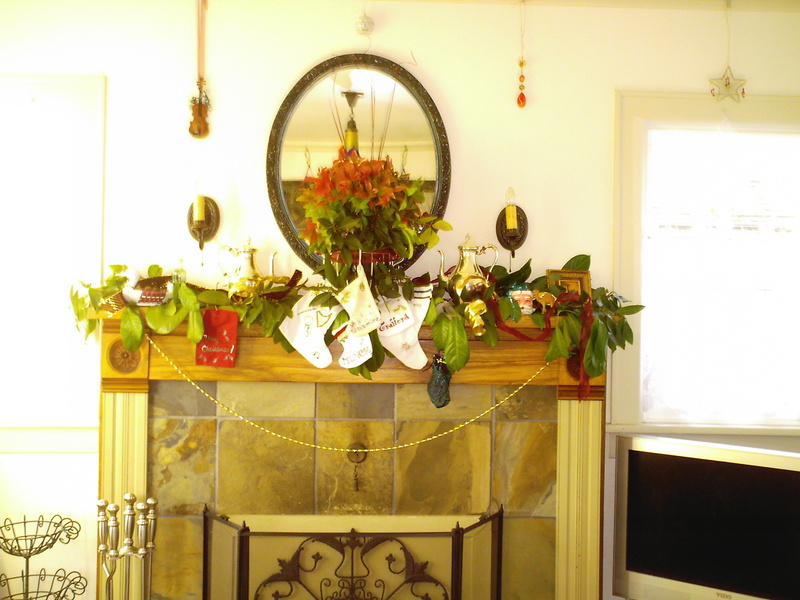 The centerpiece of this arrangement is a pretty red and green dwarf bamboo that really comes into its own in December. I put some in a tallish vase, and surrounded it with bay leaves, and the red ribbon strung through the top curlicues of the wire basket. Some red-curled sticks coming out of the top. Little things that I like that might not survive cat examination go up here safely for the season. 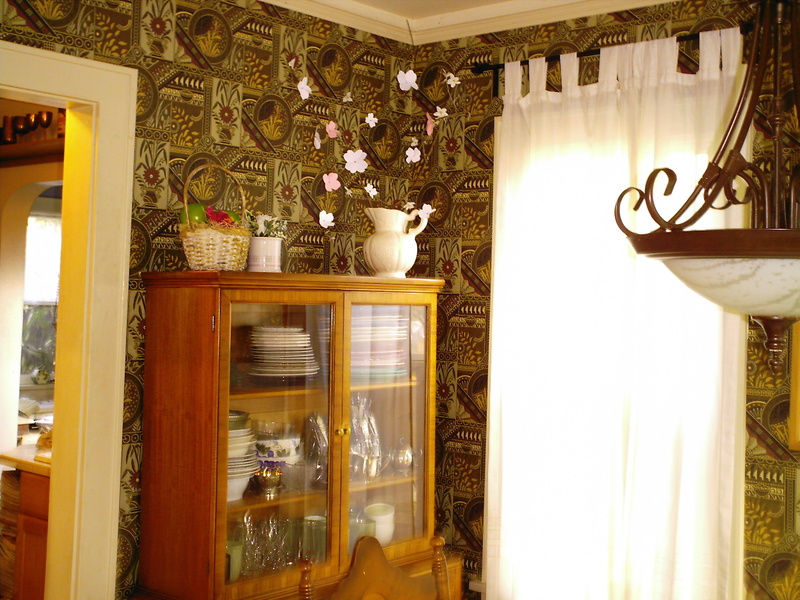 For the same reason, my favorite ornaments get hung up on the picture rail all around the living room, rather than on a tree where they would be irresistible to curious cats. 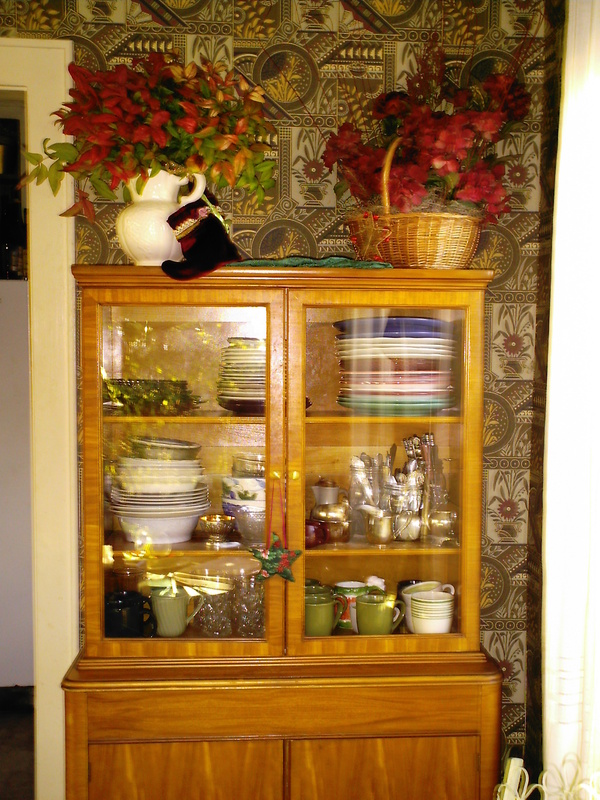 China cabinet with holiday decor. 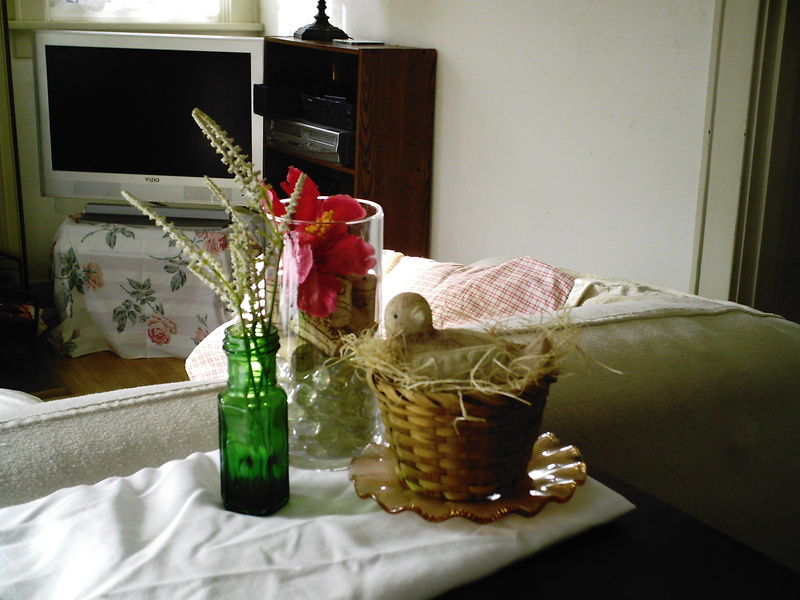 A festive table centerpiece. I have collected the plates and dishes over time from Goodwill. The red plate is a favorite from Johnson Brothers, an English manufacturer from the turn of last century, and the cabbage-leaf bowl is a newer addition to my small collection. 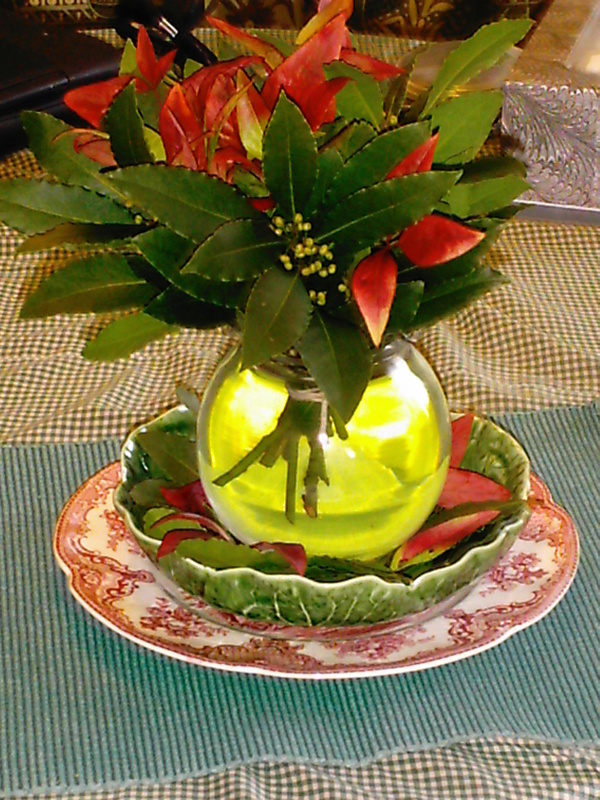 Good old bamboo and bay leaves do their holiday job in a simple vase. One new item I made over the weekend . . . 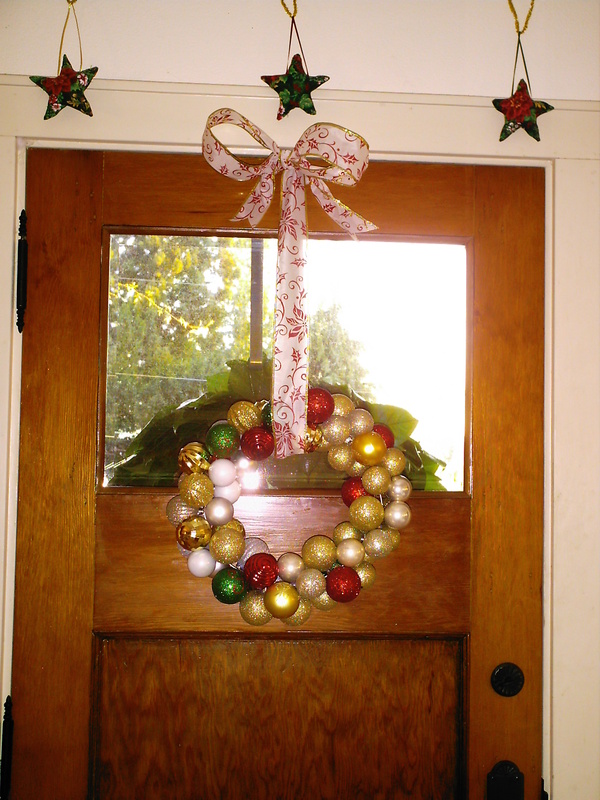 This indoor wreath was pretty inexpensive to make, because most of it came from Dollar Tree–the ornaments, ribbon and wreath hanger. The base is just a wire hanger that you shape into a circle, then hot-glue the caps onto each ornament and string them on the wire hanger. 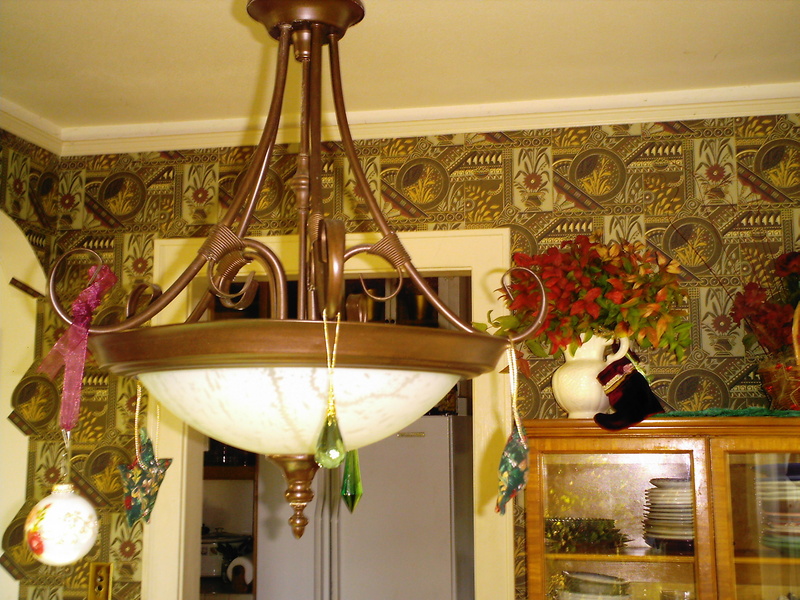 When it’s all filled–it takes about 70-80 ornaments for this–you (carefully–it’s easy to break ornaments at this stage) twist the wire ends shut, leaving the cupped part of the hanger still in shape. 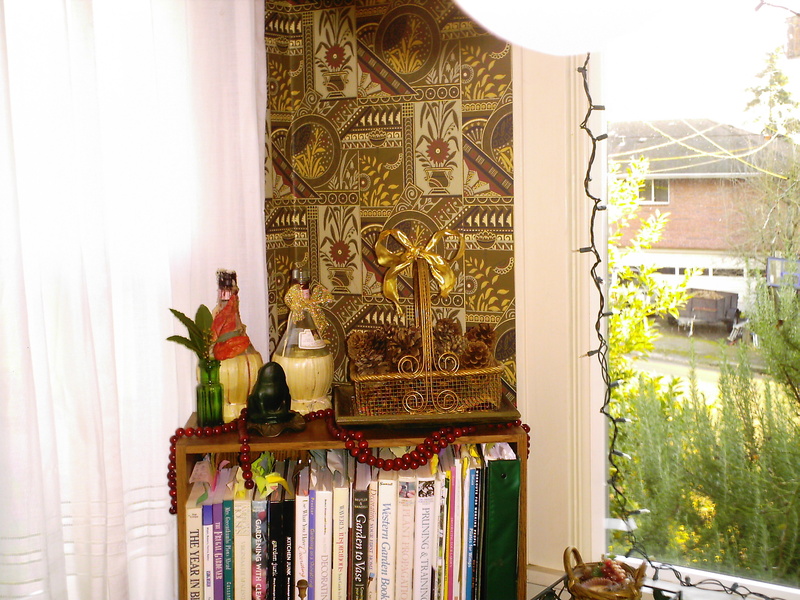 I made a loop from wire and used it to attach the wreath to the wreath hanger, and then covered the hanger with the ribbon, which I tied at the top. I haven’t made any ornaments or decorations in years–got pretty burned out from times past–but I saw this at Eddie Ross’ site and was inspired! Except for this, I didn’t really buy anything new, but I reused what I had on hand in different ways to give them a new look this year. Happy Solstice, Merry Christmas, Hanukkah, Kwanzaa, Yule and all of the other winter holidays and festivals found at this time of year! We have had rain, so it has dropped some leaves, but what a beautiful plant. 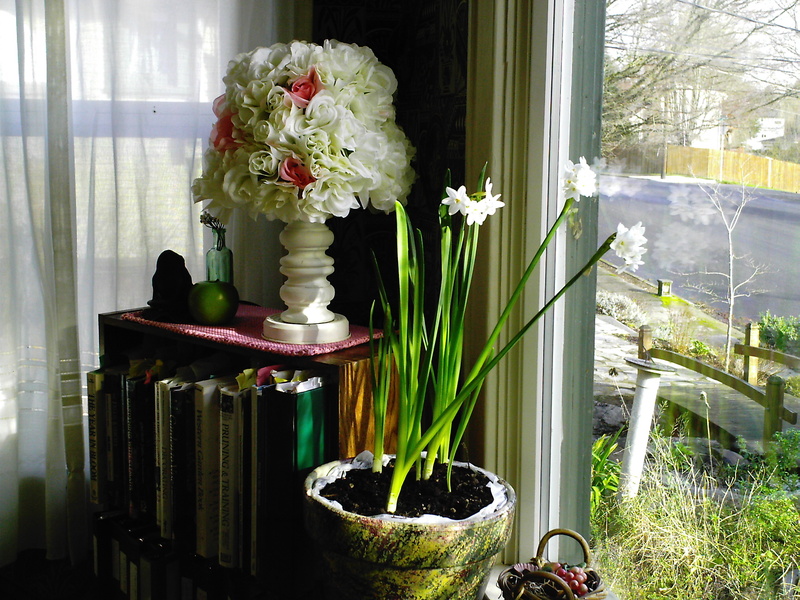 Today, November 7th, is the best day to pot up paperwhite bulbs if you’d like them in bloom for the winter holidays. So easy–put potting soil in virtually any container that is at least one-gallon size deep and wider is better, plant the bulbs so they are completely covered with soil, water it in, and put it in the garage. You want it to be somewhere where it won’t freeze but will be below 50 degrees, and where it is dark–you can cover the container with newspaper, and that works well. Then wait. By December, there will be green shoots coming up out of the soil. 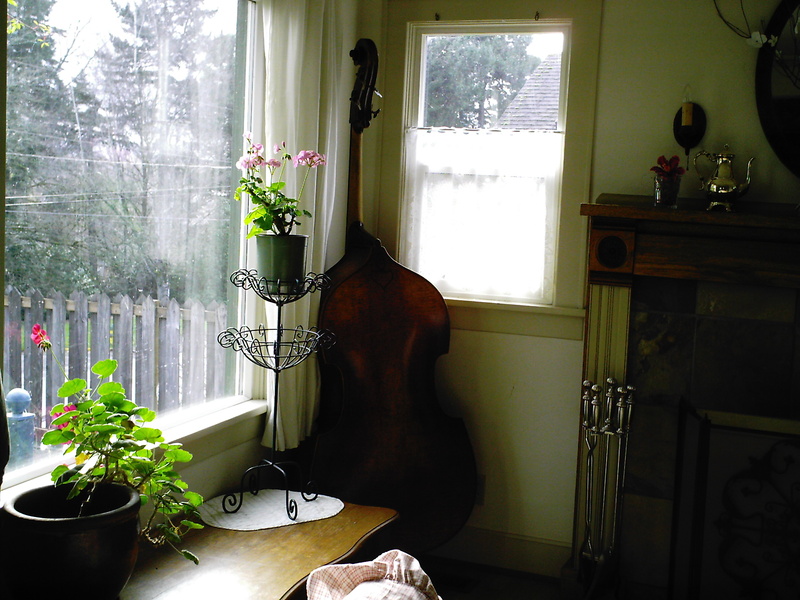 When they are about two to three inches tall, you can bring the pot up, water it and place it in front of a bright window–I put mine in the dining room on the south side of the house, and it gets good light here. They should be blooming near the end of the month, and will bloom into January (and who doesn’t need some fresh blooming flowers in January?) These are annuals for me, so I usually just compost them when they finish blooming. I’ve tried planting these outside to get them to rebloom outdoors next year, but they never really do much, even with fertilizer–they kind of give their all the first year and that’s about it, at least that has been my experience with them. Give it a try–it’s super easy and worth it! 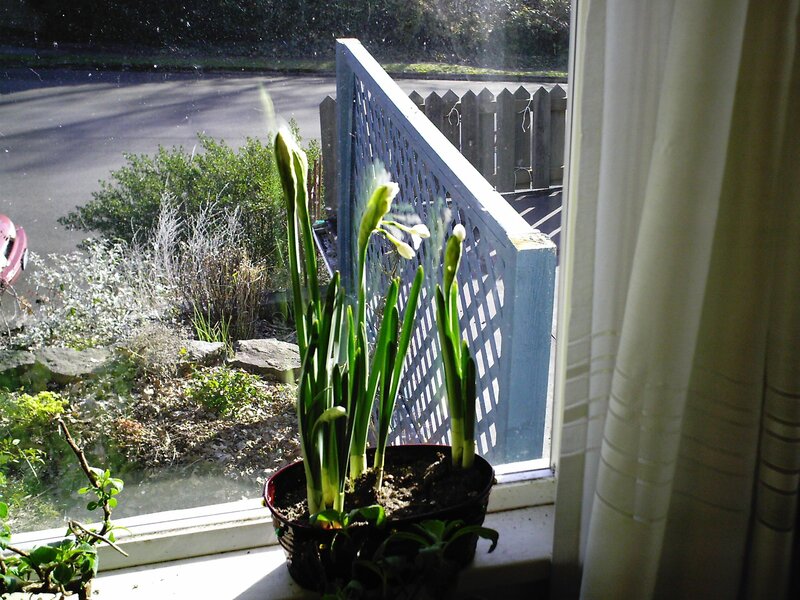 Leave me a comment and let me know if you’re growing some paperwhites this year, and how you like to use them around the house in the winter season.